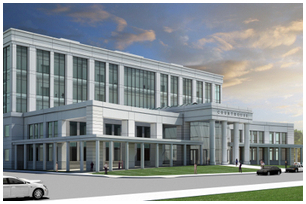 SAN FRANCISCO—The State Public Works Board (SPWB) today approved preliminary plans for the new Woodland Courthouse. The new facility, to be located on the south side of Main Street between Fifth and Sixth Streets, will consolidate operations of the Superior Court of Yolo County from seven facilities into one central five-story building housing 14 courtrooms. Approval by SPWB marks completion of the preliminary plans phase and enables the project to move into working drawings. In the meantime, Hensel Phelps Construction Company, selected in December 2011 as the project’s construction-manager-at-risk, is performing outreach to ensure that local subcontractors and suppliers have the opportunity to participate in prequalification and bidding. All qualified subcontractors, lower-tier subcontractors, and suppliers will be considered. The new courthouse is expected to generate hundreds of construction jobs and thousands more jobs through indirect benefit to the local economy. The design, by the firm of Fentress Architects in association with Dreyfuss & Blackford Architects, features a curved façade at ground level facing Main Street, with a four-column portico at the entrance which recalls the historic courthouse. The 163,000-square-foot building includes significant improvements in security, such as separate hallways for the public, staff, and in-custody defendants, as well as better seismic safety, access, and efficiency for visitors and staff. The design also incorporates numerous sustainability features; it is expected to qualify for a LEED Gold rating from the U.S. Green Building Council. Energy-saving features will make the courthouse more economical to operate over time. The courthouse project was ranked as an “immediate need” in the judicial branch’s capital-outlay plan, making it among the branch’s highest-priority infrastructure projects. It is funded by Senate Bill 1407, enacted in 2008 to provide up to $5 billion in funding for new and renovated courthouses using court fees, penalties, and assessments rather than the state’s General Fund. More information about the project is avaliable here.